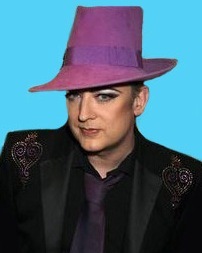 Boy George is having quite the month. While recovering from being punched in the eye by a drunken woman trying to grab his hat at a North Yorkshire England club in early April, he's taking a strong position urging gay celebrities worldwide to take a stand against the new anti gay law in Russia which bans the "promotion of homosexuality". The Russian law carries a $17,000 penalty & bans activities that "damage the health, moral & spiritual development of the underaged.” Four regions in this homophobic country can now impose these fines for "gay propaganda" aimed at minors & 2 activists were already arrested on April 12th for protesting the bill. The 80’s pop star of The Culture Club star is as outraged by the new law & has called on his gay peers to speak out against this anti gay legislation. "We need every gay star on the planet & every famous actor to make a stand about Russia's new anti gay legislation! We need major noise now," he posted on Twitter. Fierce Gay Ally Madonna, the iconic embodiment of “homosexual propaganda,” wrote on her Facebook page, “I will come to St Petersburg to speak up for the gay community, to support the gay community & to give strength & inspiration to anyone who is or feels oppressed." Obama Evolving or Avoiding Gay Marriage?